Every so often, there’s a place that defies description. Funky? Unusual? Creative? There’s nothing quite like it? 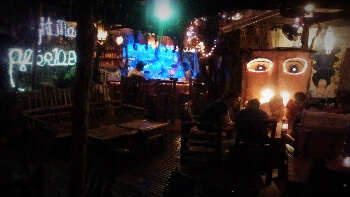 Spider House in Boracay, Philippines is that one-of-a-kind place you don’t want to miss if you’re in the neighborhood. First off, there’s the entrance fitting of the Swiss Family Robinson, or perhaps a hobbit. 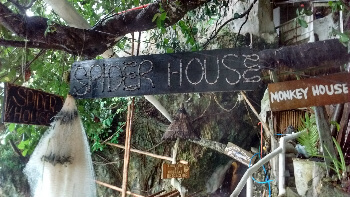 Walk under the wooden sign, follow the winding passageway reminiscent of what could lead to a cave, head up the stone steps and then down other stone steps, and then you’re there–over looking the water from the vantage point of Spider House’s restaurant. 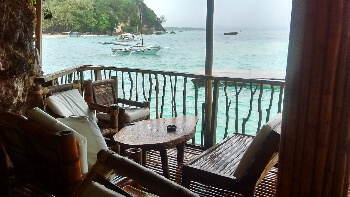 Built mostly of bamboo and wood on the side of a craggy cliff near Boat Station 1 off Diniwid Beach, Spider House, once a family home, is now a hotel and restaurant combination that makes for a fitting tropical island getaway. 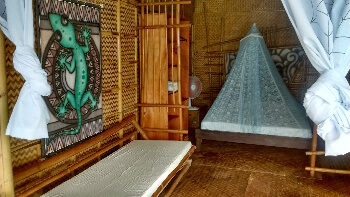 Like an eight-legged spider, the Spider House’s restaurant’s layout and hotel rooms go off in different directions in a pattern of whimsy with each area offering stunning views of the beach, the Sibuyan Sea and Boracay’s mountains that rise in the distance. Each evening, weather permitting, there’s DJ music for a sunset experience. Unfortunately, we missed out on the music because it poured when we were there, but the rain was a fine companion to dinner and drinks. Wrap N’ Roll’s menu includes terrific seafood selections, pasta dishes, pizza and a bar menu that’s an adult version of a candy counter. Breakfast, lunch and dinner are served. 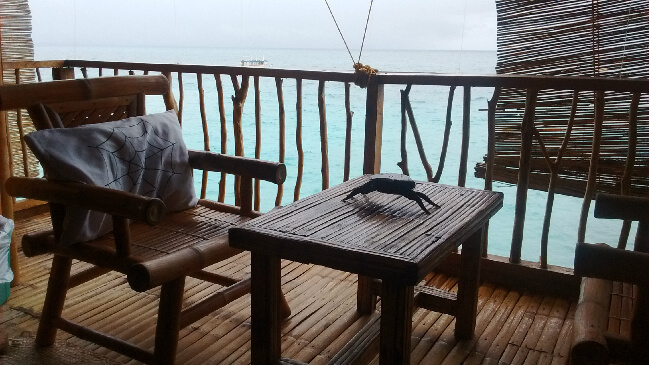 While dining, we noticed that the rain did not keep snorkelers from enjoying an evening swim. Spider House has a floating dock for guest use. Others can rent a snorkel and a mask for about $3 dollars an hour. A bamboo ladder goes from the restaurant’s deck to the water below for easy access. Like the restaurant with its varied seating arrangements with some chairs and tables tucked away from other groups while others are perched over the sea, guest rooms are unique in a blend of rustic, funky and comfortable. One of the most upscale has a private sitting area that’s an extension of the main bedroom. The room opens to the outside with only a railing between you and the sea. The private bathroom with hot water and a hand-painted sea motif is private. Room rates vary with the season. Currently the range is $55 to $100 since this is off season. Options are twin, double and queen rooms. Rates depend on room size and the sea view. Some rooms have partial views. Even those views are stunning. There isn’t air conditioning, but the provided fans will keep you cool at night. Although there’s free Wi-Fi, there isn’t TV. Why watch TV with such a view? Rooms can be booked from the Spider House website. You can also check rates at Expedia, Hotels.com or agoda.com. If you go, don’t head up to the Monkey House. That’s a private living area that’s not part of the hotel. Whether you stay at the Spider House or not, go for a meal at least. This is one of those places that you won’t forget.